we had pretty well given up on our goal of reaching a million hits by our blogiversary date of july 10 (which we didn't). we also didn't think we'd come close by our extended blogiversary date of july 13, which is when we first started using sitemeter to count our visitors. but then...like the end of some frank capra film starring jimmy stewart and donna reed...yesterday, thanks to all our friends in blogtopia (yes! we coined that phrase! ), suddenly we were literally swamped with hits! over 11,000! on a sunday! it's a record! look, mary! it's zizka's petals! zizka's petals! teacher says when a blog rings, a sitemeter gets a million hits! bill, who writes the most lurid plea to join our cause that we have seen over at stout dem blog. we'd also like to give a shout out to nothing matters, and what if it did? for a previous link we somehow overlooked. as promised, we'll add any blog not heretofore present to our blogroll happily. less than 28,000 hits to go, in the next two days! 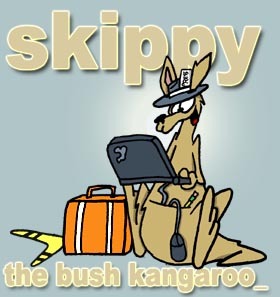 skippy needs a million hits!